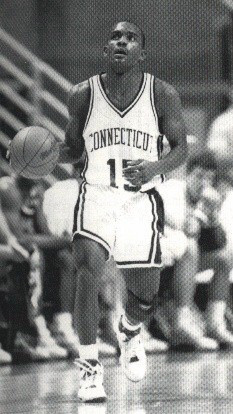 John Gwynn was a Guard for the UConn Huskies from 1987 – 1981. He was given the nickname “microwave” because he was an instant spark off the bench. John is a member of the UConn Basketball All Century Ballot and I had the opportunity to meet with him in December of 2003, when he talked about his desire as a child to play basketball in the Big East, and where his career has taken him, which now includes officiating basketball for Division I schools. John is from Hillcrest Heights, Maryland and he went to DeMatha Catholic High School in Hyattsville, MD, a 35-40 minute ride from his home. DeMatha was a very good school academically and athletically. In basketball it was ranked #1 in the country for two years while John was there. “It was a big powerhouse in basketball.” There were many good basketball players there who later played in the pros. John was a big fish in high school but he said he was among a lot of big fish. “My high school coach, Morgan Wooten, is regarded as one of the best coaches of all time; he’s actually in the hall of fame. He coached for 47 or 48 years, he won 10-15 championships and has retired within the last year or two.” John told me that every player that played on Wooten’s team was given a full scholarship to the school. While growing up, John’s father had season tickets to Georgetown University basketball games. John wanted to play for Georgetown, he had gone to its summer camp every year and he really liked the Georgetown program, but wasn’t recruited by John Thompson (coach at Georgetown at the time). However, many other schools recruited John. He went for recruiting visits to Marquette, UConn, and he almost went to visit Hawaii but didn’t have time because while at DeMatha, in his senior year John traveled to Manheim, Germany on an all star team. John really enjoyed his visit to UConn. He said that UConn spent a lot of time recruiting him. Howie Dickenman and Dave Leitao (assistant coaches at UConn) were often at John’s practices or games to watch. It was Coach Calhoun’s second year at UConn. Coach Calhoun told John that if he worked really hard, he would get playing time so John decided to sign to come to Connecticut. John told me his first year at UConn was so-so, but by his junior year the team had made it to the Final Eight in the National Collegiate Athletic Association Tournament. He had a picture on the wall in his office while he was on the court during that game against Duke University. Duke beat UConn. “I knew that we could be good but I never knew in my wildest dreams that we could be that good. We were picked eighth in the conference and we wound up #1”. During John’s senior year the team made it to the Sweet Sixteen in the NCAA Tournament and were beat by Duke again. John said, “I knew that coming to UConn was going to be a good decision but it turned out to be great.” He had always wanted to be a starter, he didn’t really like coming into the game off the bench. Coach Calhoun had told John that he was talented enough to start but he liked the luxury of having him come in off the bench and score points and give the team a boost and was given the nickname “microwave.” The nickname stuck. Coach did start John one game as a senior and he did terribly, he went 0 for 11. John helped out the team more coming off the bench, got used to it, got acclimated with it and decided it was fine with him. John got a job in CT as a probation officer almost 10 years ago but continued going from CT to PA on weekends to play in the semi-pro league. John said, “I think I’ll be at this job until I retire. It’s a good job and I don’t think I would want to go anywhere else.” When John decided to stop playing basketball he started to officiate, around 1995-96, just to have some fun. He then became very serious with the officiating; three years ago he began officiating games of Division I mid-level, Ivy League, America East and Patriot League schools, but would like to eventually move up to higher level division I school officiating for the Big East and ACC. He enjoys officiating a lot, as it has essentially taken the place of his playing basketball. John graduated from UConn with a Bachelors Degree in Family Studies. He’s married and has two daughters, Alexis age 5 and Nicole, 16 months old. He’s already begun teaching his daughters how to play basketball and Alexis is also taking golf, swim and dance lessons. John continues to follow the UConn basketball teams. He tries to bring the family to a couple of weekend games each year. John said Coach Calhoun does a good job coaching and recruiting and is now able to get top high school players in the country. He’s able to get players that Duke has always been able to get and John believes that’s what makes this team different from the one he was on. If UConn goes to the Final Four in April 2004, John will definitely be there. He went in 1999 and saw UConn win its first National Championship. The former players that were invited felt really good. Although they hadn’t scored a basket for that team, they were a part of UConn history that helped the 1999 team and Coach Calhoun. In the summer of 2002, John played in the Alumni game Coach Calhoun had and really enjoyed seeing everyone again. John’s priorities today are raising his kids and spending time with his family. John wishes that his daughters could have seen him play when he was in his prime, when he was really good. This summer he brought his daughter to a carnival and won a game where he had to shoot three balls into the basket to win the prize. Alexis wanted to know how he did it. She thought it was so great she told all her school friends, John told me as he laughed about it. He hopes maybe he’ll see his daughters play some day whether it is at Gampel Pavillion or at the first tee at the TPC. It would be really nice, it sure would be nice, he said.